With the improvements in battery technology and electric motors, the time is quickly coming where electric vehicles are matching the performance of their traditionally fuelled counterparts. Tesla is doing it for the car, and many companies are continually improving electric capabilities on two wheels. For example, the Lightning LS-218 is the world’s fastest motorcycle, gas or electric. In addition to this a small Dutch company called Bolt are working on their product – the Appscooter – a high tech, efficient and speedy electric moped that directly rivals any gas powered mopeds on the market. All these improvements are happening in the world of electric scooters as well and have resulted in the record for the fastest electric scooters being broken multiple times. There was a time where 20 mph would have been incredibly rare, but we’ve got a list of fast electric scooters where the majority comfortably go past 20 mph. If you’re thinking of buying an electric scooter for fun or commuting, the top speed is always going to be a major factor. A higher top speed means more fun and quicker commutes. 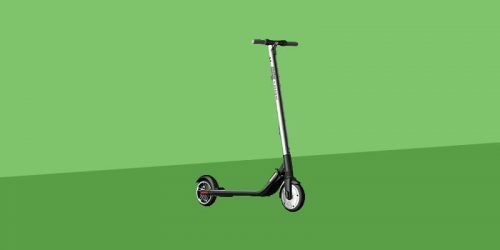 The top speed of the scooter shouldn’t be the only consideration you make when buying and there is a lot more to electric scooters than just speed, but don’t worry, as we’ll cover all of that in our reviews of the fastest electric scooters below. At 10 there could have been many different makes of scooter but we went with one that we thought was the most inventive and the most fun. The URB-E is one of the most interesting and inventive electric scooters we’ve ever seen. It comes to you from a company who’s CTO was previously a lead engineer at Porsche. This scooter is made in America – specifically California – and has a top speed of 18 mph. Despite this being rather low in comparison to some of the other scooters on the list, the design helps this scooter feel much faster than it actually is. 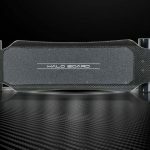 This is helped by the frame design that is built with aircraft aluminum and carbon fibre, so it’s lightweight, coming in at just 35lbs so you can throw it around without worrying about damaging it too much. The URB-E is great for your commute to work or just for fun regardless of the terrain and also made it onto our list of the best off road electric scooters. It has 10” pneumatic tires that give it very high traction, amazing torque and a coilover shock suspension system. Whilst the unusual shape may take some time to get used to, when you master it it becomes one of the most fun scooters on the list. The ability for it to ride off road just as easily as it works on tarmac means you can easily cut off time from practically any commute or enjoy whizzing around a park or a field just as easily as you would the road. The URB-E has a range of around 20 miles and a quick charge time so you’ll never be without your URB-E for long. The only negative we can see is the price, but for such as well constructed and versatile e-scooter we think this is pretty fair. The OjO Electric Scooter is a striking example of what the possible future of electric personal transportation could hold. Designed and built in Santa Monica it fits perfectly between a standard kick scooter and a full sized motorized scooter/moped. It’s fully legal to be ridden in bike lanes and doesn’t require a licence. 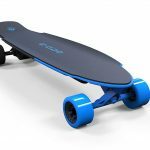 The motor is a 500W hub motor that allows the rider to comfortably reach a top speed of 20 mph. We believe the OjO could easily reach a higher top speed but as this is aimed at the commuting market we think the top speed has been limited. Read more about the rules and regulations for electric scooters in our guide to which scooter are classed as street legal. The OjO has a huge range of very interesting features. For example, it has a fully aluminium chassis that is fully waterproof with a headlight, tail light, horn and both front and rear disc brakes, with full suspension and the battery allows a range of roughly 25 miles on a single charge. It also has a patented onboard charger with a retractable cord and plug that can fit any 110V wall socket. The OjO also has a non glare screen for all the information you need when riding and even two waterproof Bluetooth speakers and a USB port for charging your phone. It does a great job at making the commute as fun and painless as possible. We think the OjO sets a benchmark for new electric scooters with its ingenuity, design and feature set. Despite a relatively high price tag we think it’s actually very well priced as it has so many benefits over traditional mopeds. For example, you can basically fuel it for free, it’s much more environmentally friendly and you don’t need any licence to run it. All of this and it comfortable hits 20mph. 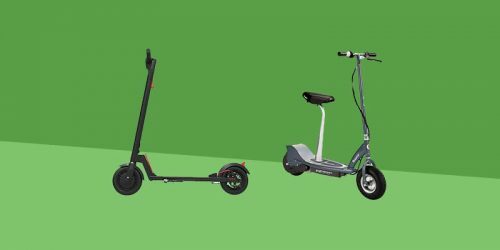 The OjO Electric Scooter also made it onto our list of the best electric scooters for adults. For a simple, smooth and quick ride, the Imax S1+ is your scooter. It’s top speed is about 20 mph, so whilst it isn’t the fastest electric scooter on the list it does provide a great ride that makes it super fun. It’s also small enough for anyone who doesn’t want to stand out from the crowd, or carry around a bulky scooter when commuting. It also has a wide deck and large, solid tires that add to the practicality and ease of use of the scooter. 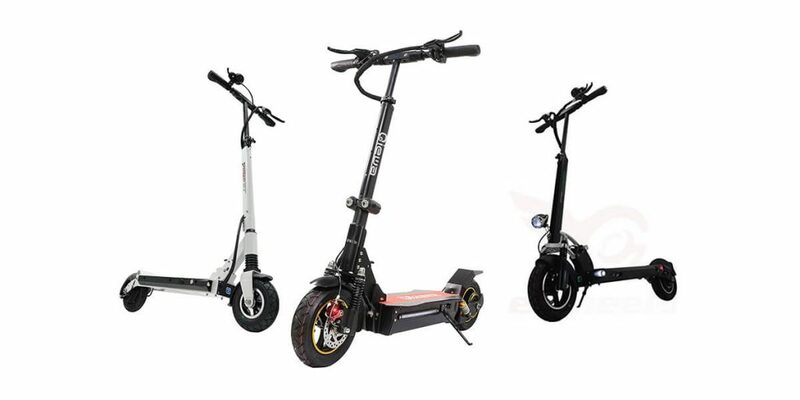 The 500W motor is a gearless direct drive rear hub motor, and the rear mechanical disk brake comes in at 140mm, which provides reliable safety when braking. The battery pack is 48V and 10Ah, this sort of power definitely can get you up a reasonable hill without losing too much off the top speed. It also allows for a max range of 25 miles which is very good. There is a brake activated LED backlight, as well as a headlight that comes on when you activate the backlight on the display. For the S1+, you are required to get a small amount of speed manually before you can activate the throttle, this reduces the strain on the battery, however isn’t very helpful if you’re carrying a large load with you. Read our full Imax S1+ review for more information. The Imax S1+ is built well and feels sturdy without coming across as bulky. The tires are robust so the journey will be relatively smooth going across any cracks or bumps. However these tires become a bit of a problem if you get a flat due to the process of replacing them, you basically have to take a section of the scooter off yourself. Despite a couple of small problems here and there we’d definitely recommend the Imax due it is great build, good ride and nice top speed. It’s pretty much perfect for having a fun zip around town and the morning commute. The Imax S1+ also made it onto our list of the best electric scooters for commuting. The EcoReco M5 E-Scooter is an eco-friendly, portable and efficient scooter with a top speed of 22 mph. It’s incredibly well made and has a few very nifty features that we don’t see very often. This includes a very nice backlit LCD screen and it even has a standard tripod mount so you can attach a GoPro or something similar like a phone mount. The EcoReco M5 is well built and has some good stats. It’s lightweight and can reach around 22mph with a 20 miles range. What is also great about the EcoReco M5 is that it has a very fast charge time. You can get from empty to 80% charge in 2.5 hours. It’s also foldable and will fold away in 2 seconds. It folds very compact and will easily fit under a desk or by your side in the subway. Despite being very well made and having some great features, the M5 does have a couple of small drawbacks, for example it’s quite expensive and doesn’t have any lights or horns. These features can be found on many cheaper models and we’re surprised that they haven’t included them on the M5. Even though these drawbacks aren’t great, I’d recommend the M5 to anyone looking for a fast, effective and compact scooter that’s a lot of fun and turns commuting from a chore into a joy. The EcoReco M5 also made it onto our list of the best electric scooters for commuting. Read our full EcoReco M5 review for more details. We’ve recently been able to test the Mercane WideWheel and we have to say it’s one of the most fun and enjoyable to ride electric scooters we’ve ever tested. The model we tried was the single motor model and even that provided enough power to really get the blood pumping. The WideWheel comes in a single and double motor configuration with the double motor reaching at least 25mph, with some people managing to get it up to 28mph! This scooter’s unique feature is the pair of ultra wide wheels. This helps to add traction so it can use all its power in addition to offering a smooth ride. It not only uses the specially designed wheels to help it with traction, but it also aids with one of the most impressive full front and rear suspension systems we’ve used. In addition to this, the WideWheel comes with a quality rear disk brake that can easily manage to stop you when going full speed. The other specs are also quite impressive, boasting a realistic 20 miles on a single charge (dual motor version) and having a range of neat features to keep your ride as comfortable and enjoyable as possible, such as a wide deck, front and rear LED lights and a kick stand. Overall, the WideWheel definitely deserves its place as one of our highest rated products. If you’d like to know more about the WideWheel, we’ve done a full Mercane WideWheel Review where we go much more in depth and share our experiences with one of our favourite ever scooters. Check the price on Fluid Free Ride’s Website. The Super Turbo 1000-Elite is a seated scooter manufactured by a California based company called Super Cycles and Scooters LLC and can hit a top speed of 27 mph. The 1000 Watt 36V motor runs at a speed of 3000rpm, which is the main reason this scooter can hit it’s impressive top speed. 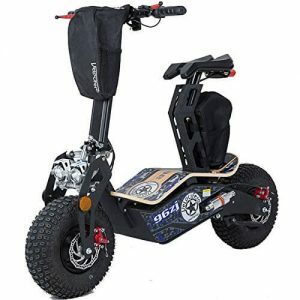 This product is great for all-terrain commutes and simple good fun due to its wide 10.5” tires and dual rear adjustable shocks, giving it a smooth and controllable ride. It has many removable parts for easy part replacement and features a seat that is fully removable if you prefer to be standing. 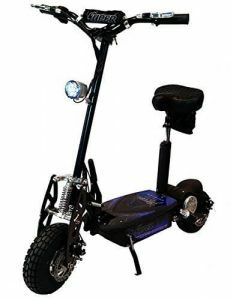 This scooter has a heavy duty chain, and LED headlight for night rides with front and rear disk brakes. It also has a weight capacity of 300lbs which is more than almost any other scooter on the market. An interesting feature is the Econo/Turbo mode, a button that allows you to decide what type of ride you want; Econo for longer journeys and Turbo for pure speed. Overall this is an impressive, powerful scooter that has clearly had a lot of work put into it. 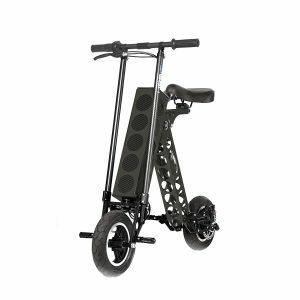 It works well with steep hills due to good acceleration and it’s powerful motor, and is great for carrying heavier weights with its 300lbs limit. The 27 mph top speed is plenty and you’ll really feel the exhilaration of such a high speed whilst being so close to the ground. The Super Turbo also made it onto our list of the best off road electric scooters because of its great performance and ability to keep a high speed when not on smooth ground. The Velocifero MAD (MotoTec Mad) is an impressive looking electric scooter designed by Alessandra Tartarini who is one of the top 100 industrial designers in the world. The Velocifero MAD can reach a top speed of 26 mph due to it’s 1600W motor and has a maximum range of up to 20 miles. The Velocifero MAD is a perfect choice for having fun off and on the road. It’s got huge tires to help it manage rugged terrain and a seat that is removable so you can choose the most comfortable way to ride. It also has a nice range of features such as foldable handlebars, double headlights and handlebar and saddle bags. This could be the perfect option for off road adventures. However, it’s not all good. There have been numerous reports of the scooter having problems shortly after being bought. 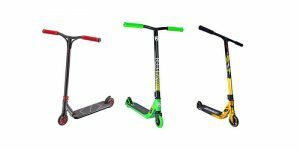 There have been problems with the build quality and some people needing to get replacement parts or scooters without ever using it. If you manage to get a working one we think this could be a great investment and provide a lot of unique fun. The Speedway IV is the bigger brother of the Speedway Mini4 Pro. It’s physically bigger, as well as having better performance stat and a few extra features. It has a top speed of over 28 mph and an incredible range of 80 miles! This is made possible by the scooters 600W motor and the 1347Wh battery capacity. It uses 10″ tires and front and rear suspension to give a very smooth ride. It has front and rear disk brakes which includes a regenerative braking system to help keep the battery topped up. It also has a nice big LCD screen, cruise control and multiple ride modes. A major plus of the Speedway IV is that it also has a foldable frame and small trolley wheels somewhat similar to the Glion Dolly to make it easily transportable. The Speedway IV has similar drawbacks to the Mini4 Pro. 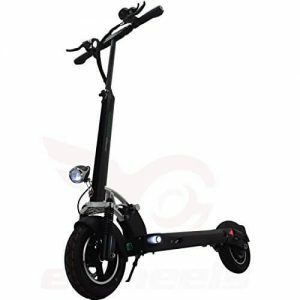 It doesn’t quite have the same expert build quality as other electric scooters and does struggle with steep inclines. 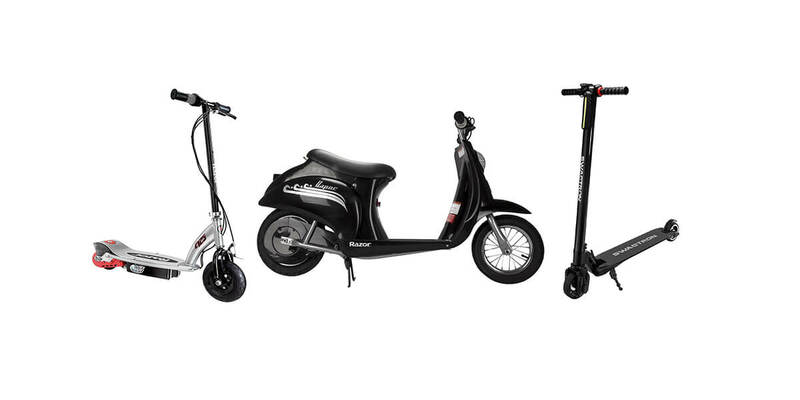 Apart from that these scooters have a lot going for them and we’d generally highly recommend them. They are premium products, and come with premium rice tags, so be aware you’ll have to reach fairly deep into your pockets to pick one up. 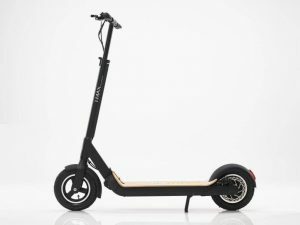 UberScoot Powerboards, formerly known as Evo, is a reliable brand of powerful electric scooters and this specific model is their most powerful electric scooter yet. It comes with a brushless 1600 Watt motor which can give you a top speed of 30mph! It has four 12V batteries and an average max range of 12 miles. Whilst this certainly isn’t as good as other scooters on the list there are still plenty of reason we love the UberScoot series of electric scooter. They have a handy economy mode button, which slows down acceleration and top speed to conserve battery life. Further specs include front and rear disk brakes for quick stopping, front and rear lights, a key ignition, a horn, and a chain driven motor. UberScoot claims that the battery can withstand 250 full cycles before it dies, which is around 3000 miles in total. The seat has an adjustable height and is even removable and is made purposefully very straightforward as it is quick release, this also means the scooter can be converted into standing rather than seated at any time you want. The scooter comes in at 117lbs, which is obviously heavier than a lot of the other scooters on this list. We find this to be a bit of a shame as since it is folding you’d hope you could carry it around quite easily. However the folding mechanism is very good and you could easily slot this into your car or take it on the train. Despite the small problems here and there the UberScoot is a great electric scooter and it’s incredibly fast. It’s one of the most powerful electric scooters you can buy and is a whole lot of fun whilst being incredibly versatile. 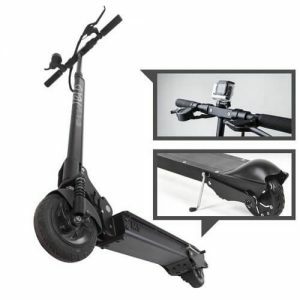 If you want a cheaper version of this product then UberScoot also offers a 1000 Watt electric scooter for around $150 less, I’d happy endorse this scooter as well, while it’s less powerful than its big brother it still packs a punch when riding and is a lot of fun! 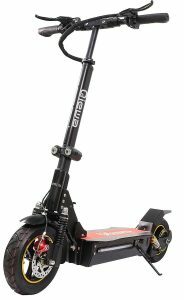 The Qiewa 800W is a super fast electric scooter that can can reach a top speed of over 35 mph! 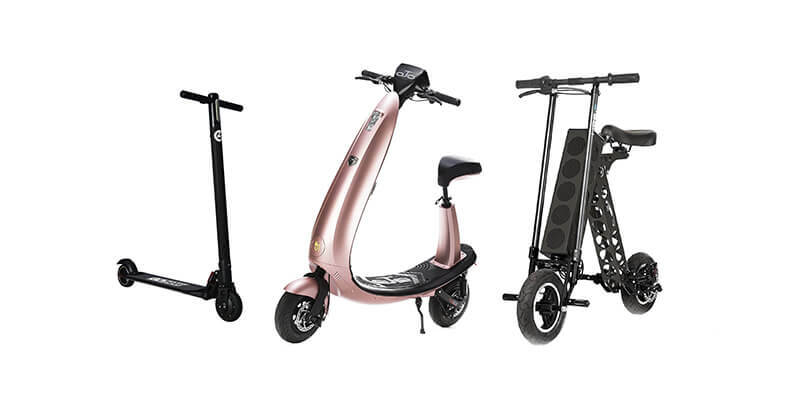 It’s made by a Taiwanese manufacturer and these heavy duty scooters can outperform almost all other scooters on the market. Not only is it one of the best high speed electric scooters, but it also has a lot of other features that make it well worth buying. For example, it has a maximum range of up to 60 miles! It also has plenty of features that make it road ready, such as full front and rear suspension, front and rear disc brakes, LED headlights, taillights and even side lights. The Qiewa also includes a horn, keyless entry remote and an alarm system to keep it as safe as possible. The build quality of the Qiewa is also really good. It’s made from high strength aluminum and has an IP6 waterproof rating. It can also be folded to be taken with you or stored easily. All of this combines together to not only offer one of the best fast electric scooters, but just one of the best electric scooters in general. If you’re looking for something a little less, that’s a bit better for commuting, then Qiewa also offer a Qmini model that takes the best parts of this scooter and just scales everything down to make it easier for the morning commute. The Dualtron Thunder is claimed to be the best performing electric scooter in the world. And from our research that seems to be about right. The only reason it isn’t in the 1st position is because the next scooter is just a tad faster, however the Dualtron Thunder has a notably better maximum range at a staggering 75 miles! The specs of the Thunder are as impressive across the board. 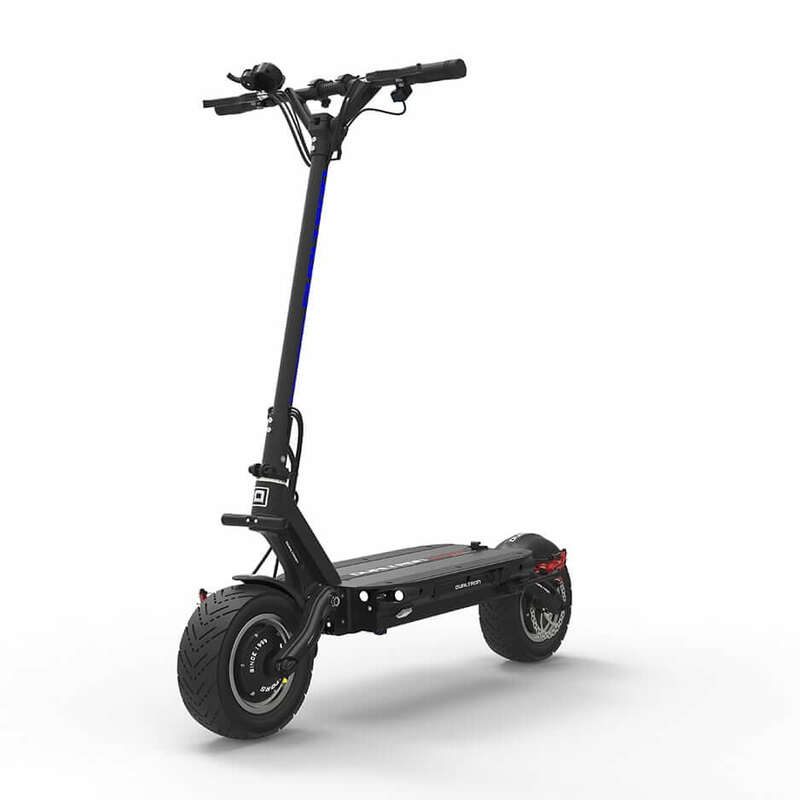 The 60 volt, 35 AH battery can be charged in around 5 hours with the Dualtron quick charging kit and the scooter can climb a very impressive 47% hill. 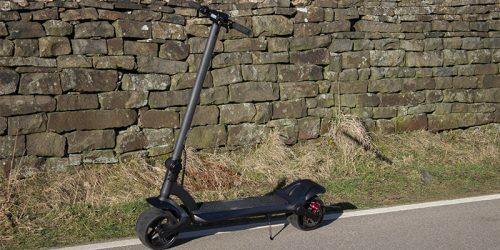 It’s not just the power and battery that are worth mentioning, the entire scooter is incredibly well made, with some of the best materials and features you will find anywhere. For example, the braking system uses hydraulic brakes with ABS as standard and 160mm disks and the frame and handle are aviation grade 6082-T6 aluminum alloy with the shaft being made from SCM440 steel, and plastic covers. 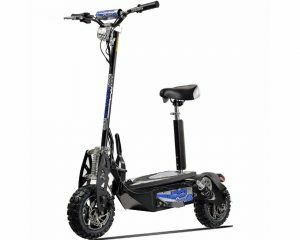 If you’re looking for one of the absolute highest quality and best performing electric scooters then the Dualtron Thunder is the one to get. Now onto the fastest electric scooter that you can buy right now. If you’re looking for the absolute quickest electric scooter then the Nanrobot RS7 is the one you need to buy. It has an insane top speed of 55 mph due to its dual 1600 W motors. It’s maximum range is 55 miles, which is very impressive but is 20 miles less than the Dualtron Thunder. It can, however, climb hills of up to 65 degrees. Another place the Nanrobot really shines is its build quality and features. Its big and looks a bit brash but is made from high quality aluminum and steel with a fairly nice black and red finish. It has hydraulic shock absorption, a wear resistant tire and even has high power LED headlights, is foldable and has a kickstand. 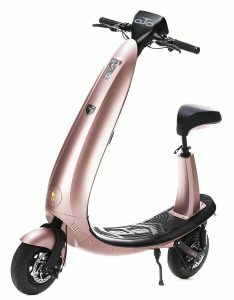 This means, that although this is built for performance and a high top speed, it still has the practicality of some scooters that are built specifically for commuting. This isn’t the only Nanrobot scooter that could have made it onto this list, but for the sake of variety we’ve decided to just include their best. 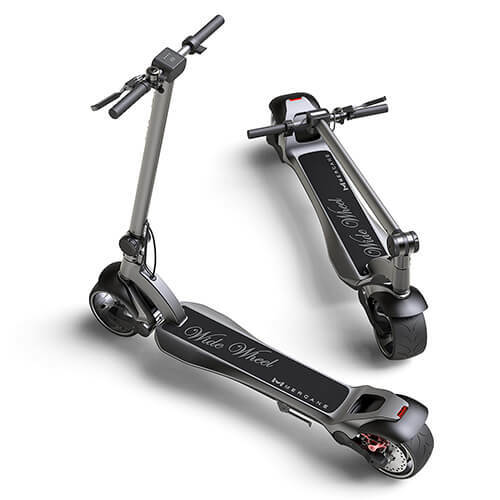 Their other products include the very popular D4+ which is more of a mid range scooter but can still manage a top speed of 40mph! 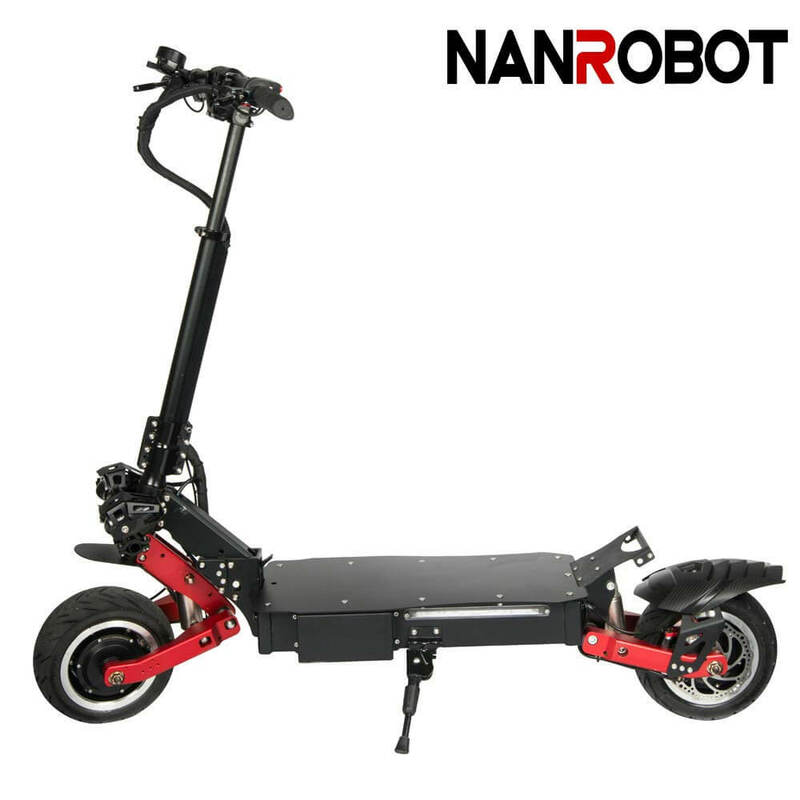 All of Nanrobot’s scooters tend to be positively reviewed and offer some of the best value for money out there. All of the tops speeds mentioned are very dependent on the type of ground that the scooter is being ridden on and the weight of the rider. 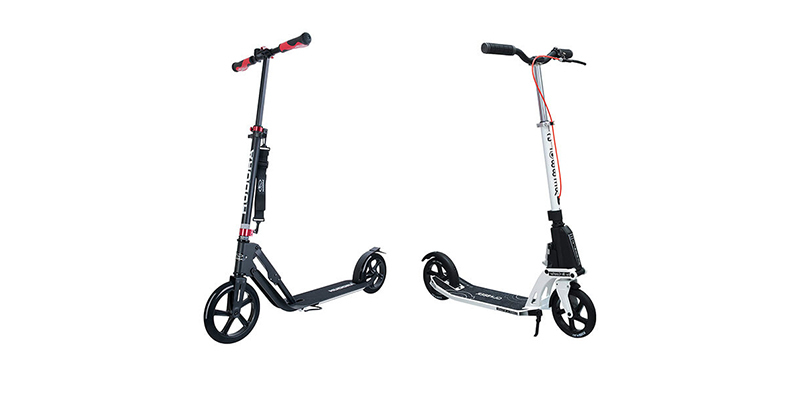 A smooth flat surface with a very lightweight rider will allow these scooters to easily reach their top speeds and sometimes even more. The numbers we have used are the ones specified by the manufacturers but we have seen some cases of many of these scooters actually achieving even greater speeds. Thanks for this wonderful article about the fastest electric scooters available on the market. This article is very helpful for a beginner like me, you have included all the best product in your list. 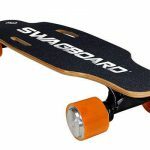 After reading, I have decided to pick Uberscoot 1600 Watt. What do you say about it? The Uberscoot is fast and a lot of fun! I’m sure you’ll have a great experience with it. Thanks for commenting! Thanks for the kind words, Eddy! Curious if anyone has any info on the “Dualped” line owned by Chris Dallas out of Ontario, Canada. These scooters are capable of speeds in the 50-60mph area and have something like 3200V batteries which allows the scooter to run for 40-50 miles. Crazy fast. Heavy but I am looking to buy for enjoyment around neighborhood and not too concerned about traveling with it. Wondering on the quality of batteries, scooter construction, motors in the wheels, warranty and general info like that. Anyone with insight, I would love to hear what you have to say. Does someone has experience with NanRobot RS2 or RS4? Qiewa Q1 hummer is it better than Nanrobot scooters? These electric scooter looks great and have a good speed also. I would love to have any of them.